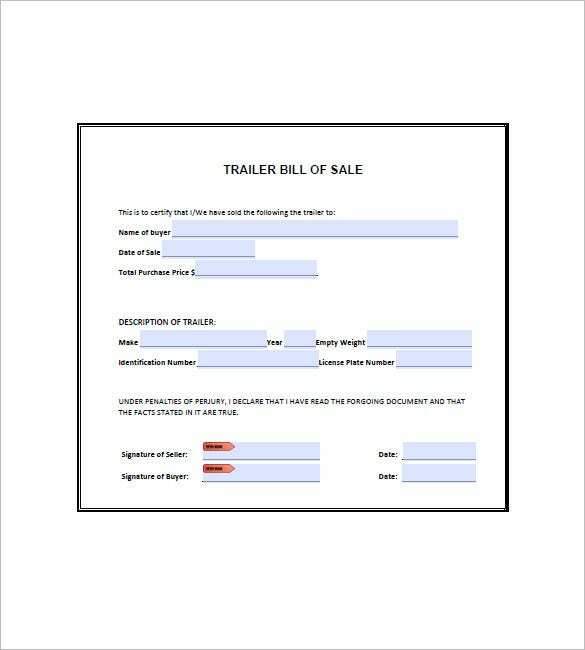 Trailer Bill of Sale – 8+ Free Sample, Example, Format Download! The use and acquisition of a trailer truck has been increased since the cost of houses increased and as leisure for people who love to travel and still have the home sensation with them. 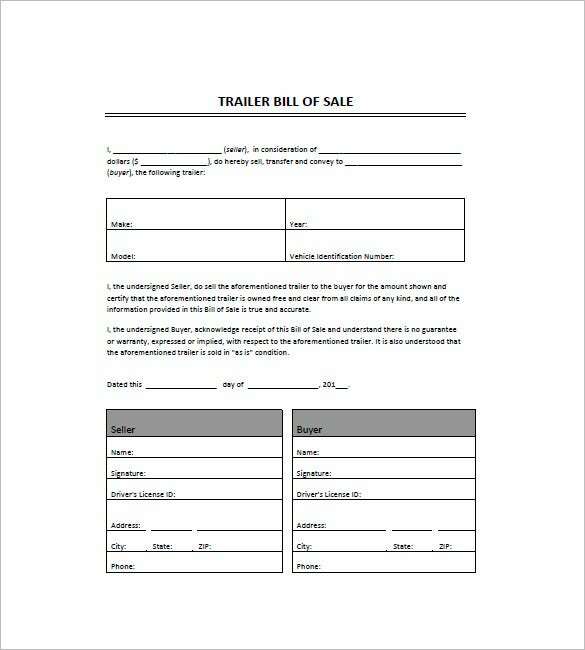 For trailer truck sellers having the business bill of sale serve as the transaction for a client having their own trailer and for warranty claims in unexpected events. equine2.com | Designed for comprehensive data display, this new sample form contains fields for dates, names and addresses of both buyers and sellers. 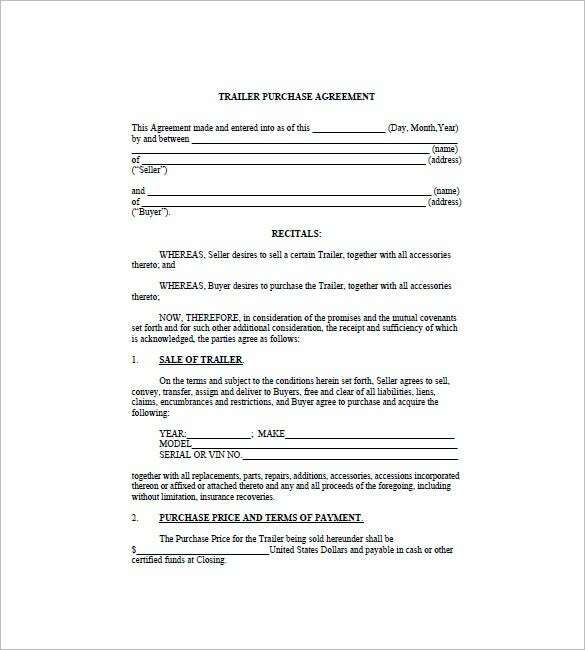 Other fields include details about the trailer, purchase terms, seller covenants and warranties. Space for all other relevant details is also included in the form. ct.gov | This form is in free PDF format with cells for noting details in a completely tabular manner. The included fields include seller details, selling price, motor vehicles description. The form bears the header of DMV, Connecticut with the official insignia. 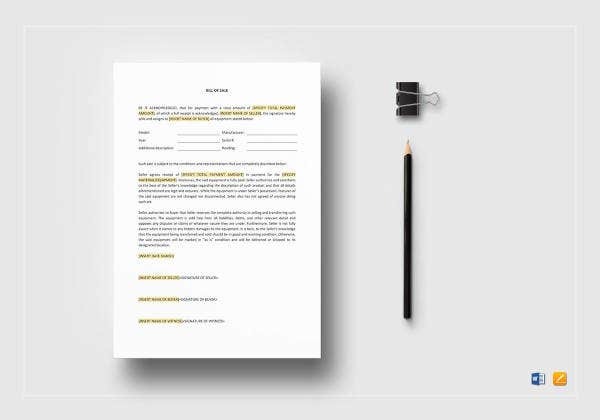 businessformtemplate.com | Completely in sync with recent legal requirements, this form has editable fields with bold headings and subheadings like purchase price, terms of payment, seller warranty, transfer of title, possession, modification/waiver, details on closing etc. 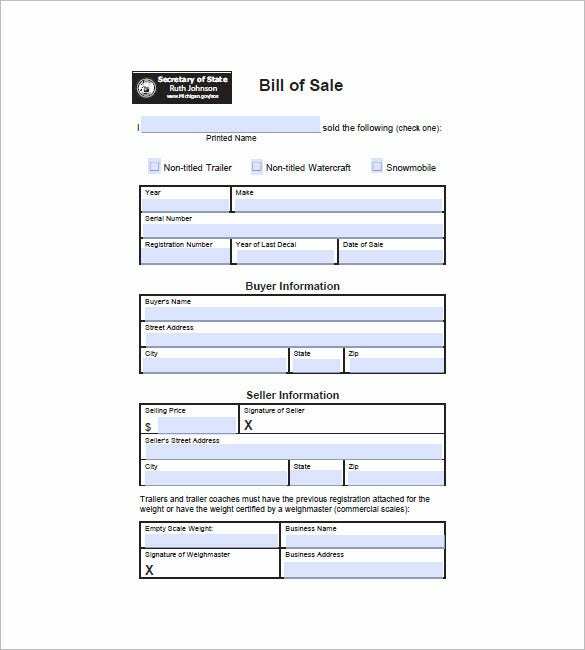 michigan.gov | This is a free printable PDF format of Bill of Sale complete with State of Michigan’s logo, and header. The other fields include buyer information, seller information and other details about the vehicle. 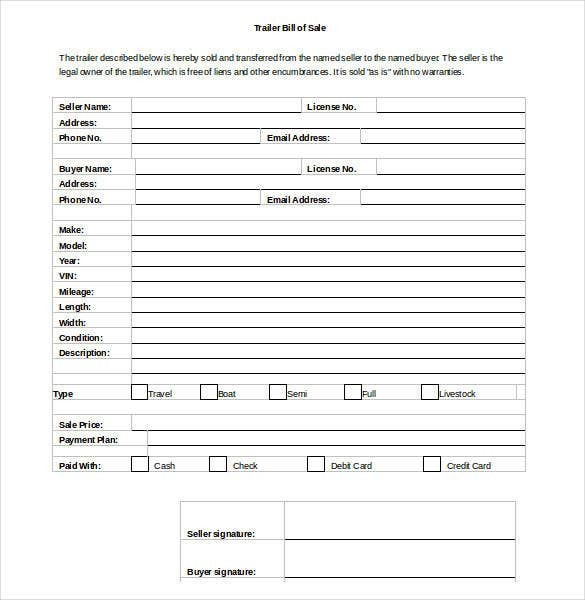 The form can be edited online and directly printed. 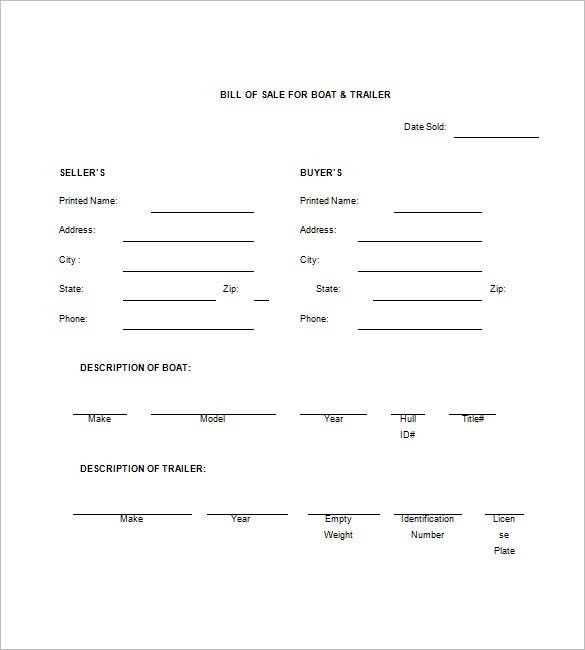 This trailer of bill sale form has a neat and minimal layout with tabular data display options. For example, the fields include make, model, year and VIN number. 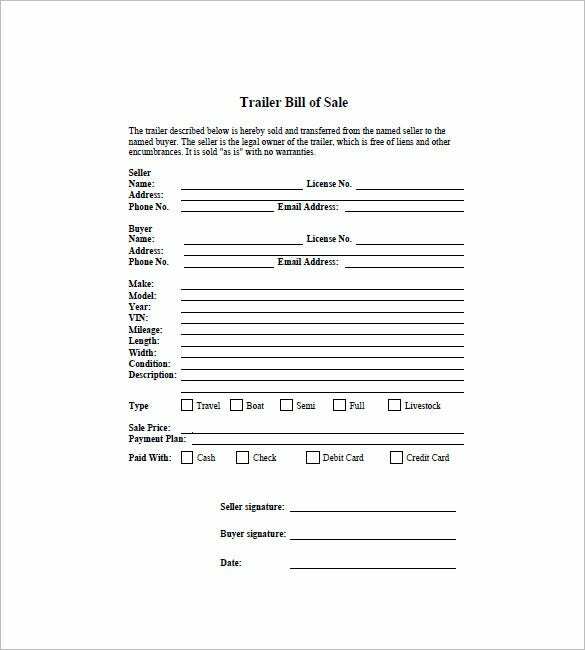 The buyer and seller info can be tabulated in clean cells of pre-defined order with field names and areas for info storage. 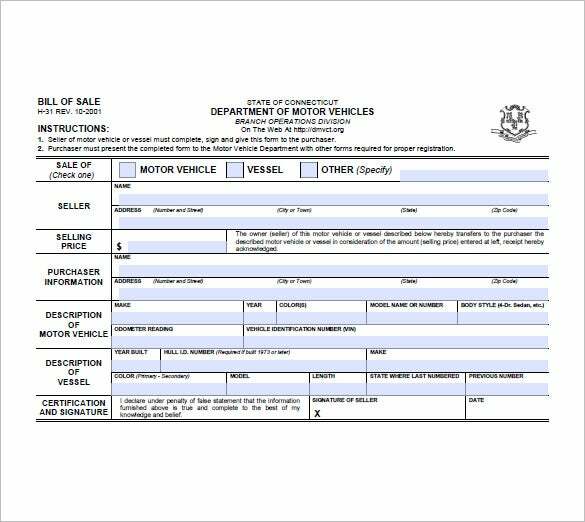 formscdn.com | A single page Trailer Bill of Sale template for formal purposes which includes fields for all relevant details which are necessary during the sale and purchase of motor vehicles. It comes with pre-defined declarations and conditions which may be applicable during the situation. The sample bill of sale can be downloaded in the internet,you can have the own preference of designs and styles can be managed for the templates chosen; you may have the fonts changed the way you want as it can be done in the template.